From one of the leading historians of the Jewish past comes a stunning look into a previously unexamined dimension of Jewish life and culture: the calendar. In the late sixteenth century, Pope Gregory XIII instituted a momentous reform of Western timekeeping, and with it a period of great instability. 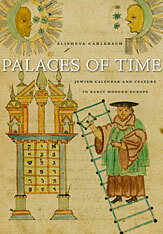 Jews, like all minority cultures in Europe, had to realign their time-keeping to accord with the new Christian calendar. Elisheva Carlebach shows that the calendar is a complex and living system, constantly modified as new preoccupations emerge and old priorities fade. Calendars serve to structure time and activities and thus become mirrors of experience. Through this seemingly mundane and all-but-overlooked document, we can reimagine the quotidian world of early modern Jewry, of market days and sacred days, of times to avoid Christian gatherings and times to secure communal treasures. In calendars, we see one of the central paradoxes of Jewish existence: the need to encompass the culture of the other while retaining one’s own unique culture. Carlebach reveals that Jews have always lived in multiple time scales, and demonstrates how their accounting for time, as much as any cultural monument, has shaped Jewish life. After exploring Judaica collections around the world, Carlebach brings to light these textually rich and beautifully designed repositories of Jewish life. With color illustrations throughout, this is an evocative illumination of how early modern Jewish men and women marked the rhythms and realities of time and filled it with anxieties and achievements.